In Early May 2013 the St Andrew’s on The Terrace Parish Council voted for St Andrew’s to become a Living Wage Church. Following that great Social Justice decision, on 23 May, Margaret Mayman spoke at the launch of “The Living Wage” campaign in Auckland. Read the speech here: living wage. This submission is made by the Parish Council of St Andrew’s on The Terrace, Wellington. St Andrew’s on The Terrace is a Presbyterian congregation, first established in 1840, with a long and distinguished record of working for social justice and caring for people within and beyond our community. 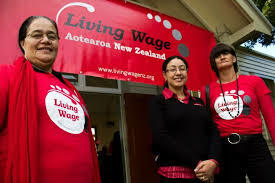 St Andrew’s has consistently promoted the adoption of the Living Wage since the Living Wage movement came to Wellington, and as we have previously stated “as a Christian church we are motivated by our concern for the Common Good of our society. Recognising the worth of every person is a core value of our faith. As members of a progressive Christian faith community, we stand in solidarity with the vulnerable and we care deeply about the well-being of all New Zealanders. As the gap between the rich and the poor grows in New Zealand and poverty increases, more and more New Zealanders don’t get paid enough to meet their needs, enjoy their lives and participate in society.